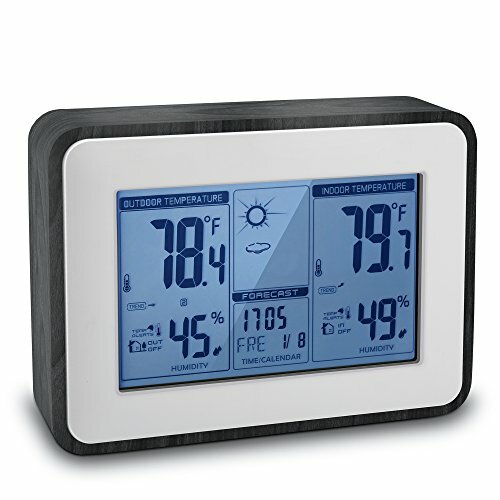 ★ MULTIFUNCTIONAL - Work as hygrometer, thermometer, alarm clock, calendar, week, day, time ect. Perfectly meet your multiple needs. ★ ATTRACTIVE - Simple structure with wood grain material, stylish and elegant appearance make it fit to be placed in any positions. ★ POWER SOURCE - Main part powered by USB charging cord or 2 x AA batteries (not included). Transmitter powered by 2 x AAA batteries (not included). ★ NOTICE - Transmitter may stop working if it is exposed to rain, please keep it away from the rain. Good product and good price.